Sure, I work in the lab so marketers drive me up the wall and vice versa. Nothing new, and I don't intend to draw new blood here today. Instead, I am LOL with this new product and product name - Vampirella. "Blood-sucking meat trays to go global"
"The technology behind Vampirella expanded polystyrene (EPS) meat trays is now available for licensing globally. The single-layer trays feature a closed-cell surface structure and an open cell core layer that absorbs the blood excreted from meat through needle punched holes in the surface layer, thereby presenting a cleaner appearance to the consumer." As someone who was once told during a performance review "that I was intimidating the marketers", I do have to tip my hat to the people behind this one. I love it. This map comes from the Weather Sealed blog. 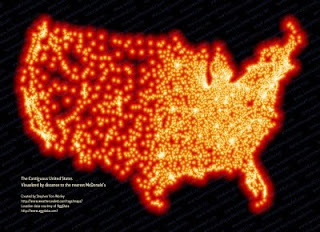 Each dot is a McDonalds. The analysis in the blog is raises a good question: what point in the lower 48 is most distant from a McDonalds? The answer is in that small black spot in North Dakota, somewhere between Meadow and Glad Valley. It's a 145 mile drive to get your fix on fries. Thinking of Thomas Friedman's "Golden Arches of Global Conflict Prevention" Does this mean North Dakota is the state most likely to declare war on Canada? It certainly is not anything new, but you don't reach a global optimum by optimizing individual variables . That's what consistently irks me about single-interest activists of all creeds. They are simply interested in optimizing one variable and assuming that the global situation will therefore follow. The new Plastics Scoreboard by Clean Production Action is one such example. You can guess what the targets are (chlorine, bromine, petroleum based monomers) and what the solutions are - agricultural based sources. And all the usual arguments against going to bio-sources polymers can be made here (destroying food, the non-sustainability of these practices...) but in keeping with the introduction above, this effort is taking a multivariable optimization and worrying about just one part of it. Weighting this one variable above all others  is where the arguing should begin. I'm certainly not against considering such a reduction, but the case hasn't even been made that the one variable here is of such importance. But as is usually the case (I can't think of even one counter example), the single interest groups start out with the weighting in place and go from there. Without even attempting to convince anyone of the initial assumption, they argue for the outcome. As a simple example, consider trying to find the latitude (the x variable) and longitude (the y variable) for the highest point in the continental US. The correct answer is 36 N, 118 W - Mt. Whitney in California. Starting at St. Paul Minnesota, 45 N,93 W, I can try and find the maximum elevation along the 93 W line, which would be somewhere in northern Minnesota, call it 47 N. Then keeping that constant, I would look for the highest elevation along the 47 N line, which would be somewhere in the western Montana about 112 W, quite a ways from California. If I would try and maximize the variables in the other order, I would get a different result. The maximum altitude along the 45 N line is somewhere along the Montana/Wyoming border, about 110W. The maximum elevation along that longitude line is pretty much right at 45 N or a little south. So in the first case, I found 47 N, 112 W, in the second case, I found 45N, 110 W. Two different results and neither one is correct. And in addition, different starting points will yield different results as well. Yes, it could happen that you do reach the global optimum that way, but the odds of that occurring are very slim, and decrease as the number of variables increase. Obviously for a one-variable problem, one or more of the local optimums will be the global optimum. For a two variable situation, you can already be in trouble, as you can see above. If certain variables are weighed considerably higher than others the complexity can be reduced. We've all met people - make that children (regardless of age) who weight their happiness above all others. They have managed to take a multivariable problem and reduce it to a single variable. They are in the news once again. (Here is a free access summary.) I have had time to read the article just yet, but this research seems to be taking a slightly different tack, namely using two different sizes of polymers which favorably interact through pi-pi bonds. In essence, one is plasticizing the other. I've mentioned this category of materials in the past(1 and 2) and have always been underwhelmed. I don't see this being much different. "Heat and heal" is a common characteristic of most thermoplastics, as heating allows for flow - interpenetration of the two surfaces. HDPE pipe is joined like that, potato chip bags are sealed like that... It's not wonderful new technology. Courtesy of the RSC (an organization that I do a fair amount of peer-review for) comes a preview of a survey on peer review. Having not taken part in the survey, I'll comment on parts of it that I find interesting. "The survey found that respondents were divided over potential incentives for taking part in peer review. Over half felt payment in kind (e.g. journal subscription, waiver of their own publishing costs) would make them more likely to review, 41 per cent said cash payment would be their preferred reward (though this drops to 2.5 per cent if the author has to cover the cost), while 39 per cent favoured published acknowledgement in return for their services." "A further finding was that although reviewers see detecting plagiarism as a noble aim, it is not practical within the current peer review framework." This got my eyebrows hunched. Given the easy access to searching tools, it's pretty darn easy to at least perform a cursory look for palgarism: just enter a few phrases from the paper and see if anything matches it. It's a technique that school teachers use, and though it is not a guarentee as it is only a statistical approach, it still can work amazingly well. Additionally, the evidence is almost irrefutible. Lastly, "While there are undeniable gripes about the peer review system in its current form, no viable alternatives have yet presented themselves that could drastically improve the way research papers are reviewed and published - a fact echoed by the reviewers who took part in the survey." That does sum it up quite well. So when it comes to picking tires for a moon car, a standard set of Firestones or even a premium set of Michelins just aren't going to cut it. Even the designs from 40 years ago won't work as the expectations and demands on the new rovers will be higher IF we (meaning the US) ever return to the moon. Goodyear has been on the case and has developed new tires that are also thought to be Martian worthy, not just lunar worthy. The design spec for these tires must be truely mindblowing. Think not only about the temperature extremes (often with the high and low occuring on different sections of the tires at the same time) but also the massive radiation fluxes (no ozone to cut off anything below 320 nm) which would chop up all the organics like a Benihana chef goes through vegetables. Just even trying to test the materials in a meaningful way would be a huge undertaking. I really found all of this impressive. 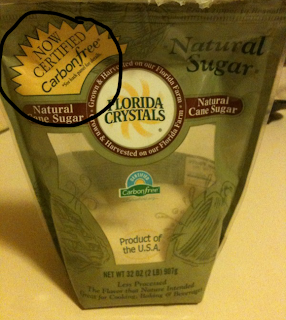 I can't imagine how they removed all the carbon, especially profitably since carbon is 12/30's = 40% of the mass of the purified sugar. Mining operations can make a profit, but that is for minerals and elements that are sold for hundreds/thousands of $/lb, not a food source for people on a caviar-free budget. Besides, if this technology spreads, it there will be no chemistry left for organikers.